I just wanted to thank you for spending so much time with us yesterday. We enjoyed getting to know you and the puppies. We are very happy with Cosmo and can’t wait ’til he can come home with us. We also really enjoyed seeing the adult dogs….it reaffirmed that we are making an excellent choice. We thought you would like to see some pictures of Cosmo, so I decided to send you some! There are some from before he got his new haircut and after so you can see the difference. 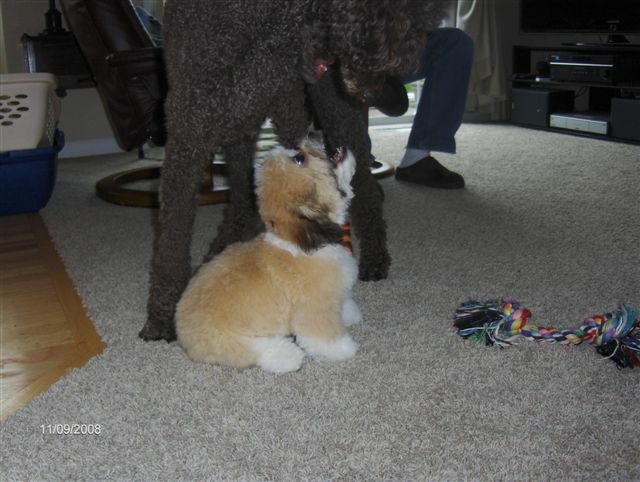 He is loving his new home, he loves to play with Cleo (cat) and Nikki (dog, standard poodle). He is really well behaved and he knows to sit and lay down. He is also in puppy kindergarten, with some other Lillybits shichons, Teddy and Molly.